Valdez Museum and Historical Archives | André & Associates Interpretation and Design Ltd. Interpretive Planning and Conceptual Design through to Fabrication and Installation. "AAID was involved with the exhibit upgrade from conceptualization to installation. 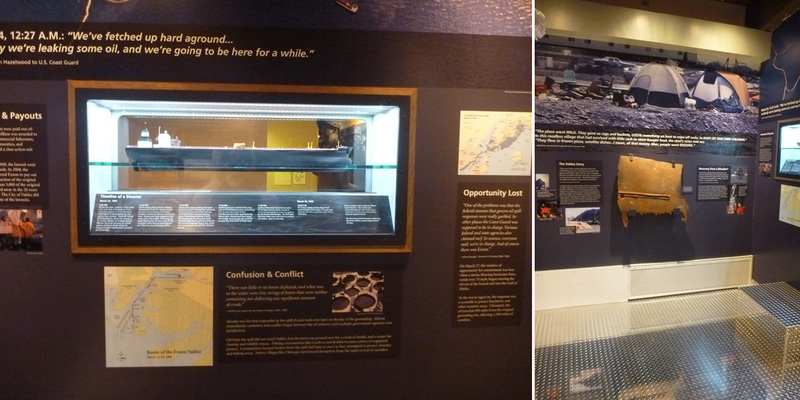 The AAID team professionally navigated the sensitive subject matter and provided the Valdez Museum & Historical Archive with a visually appealing, compelling, and engaging exhibit. The AAID team was sensitive to a modest budget and navigated the long distance relationship effectively." We are proud to announce the successful opening of the Exxon Valdez Oil Spill exhibit at the Valdez Museum and Historical Archive. We worked closely with community focus groups, did the interpretive planning, designed and oversaw the fabrication and production of this small but important exhibit in close cooperation with museum and archive staffers. The exhibit contains up-to-date information, current events and improvements in technology and wildlife restoration over the past twenty years. It reflects the tragedy that occurred and ensures the people’s voices are heard.